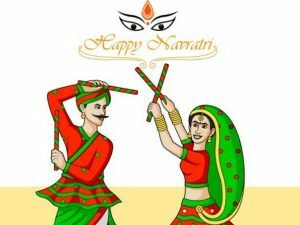 Among the popular festivals celebrated in India, Navaratri is among the longest. One of the things I cherish is telling the story of Navaratri through a power point. Like the other festivals of India, Navaratri is rich in meaning. At one level, Navaratri signifies the progress of a spiritual aspirant. During this spiritual journey, the aspirant has to pass three stages personified by Durga, Lakshmi, and Saraswathi. The different stages of spiritual progress are reflected in the sequence of celebrations during Navaratri. During the first three days, Durga is worshipped. She personifies that aspect of shakti which destroys our negative tendencies. The process of trying to control our senses is akin to war for the mind which resists all attempts at control. So, the stories in the Puranas symbolically depict Devi in the form of Durga as waging war and destroying the asuras. However, getting temporary relief from the clutches of vasanas does not guarantee permanent liberation from them. The seeds of the vasanas will remain within in latent form. Therefore, we should supplant them with positive qualities. The Bhagavad Gita refers to these qualities as daivi-Sampat, literally “Divine wealth.” Correspondingly, we worship Lakshmi during the next three days. Lakshmi is not just the giver of gross wealth or prosperity; She is the Mother who gives according to the needs of Her children. Only one endowed with daivi-Sampat is fit to receive the knowledge of the Supreme. Accordingly, the last three days of Navaratri are dedicated to worshipping Saraswathi, the embodiment of Knowledge. She is depicted as wearing a pure-white sari, which symbolizes the illumination of the Supreme Truth. The tenth day is Vijaya Dashami, or the festival of victory, symbolizing the moment when Truth dawns within. The significance of Navaratri for Householders However, Navaratri is not only significant for spiritual aspirants; it has a message for those who lead a worldly life as well. They should invoke Durga’s help to surmount obstacles, pray to Lakshmi to bestow peace and prosperity, and contemplate upon Saraswathi to gain knowledge. These three ingredients are just as necessary for complete worldly life. In reality, when we pray like this, we are but invoking the Shakti that is within ourselves. Durga, Lakshmi, and Saraswathi are not different entities, but different facets of the singular Divinity. Some of the spiritual practices associated with Navaratri include fruit and milk fasts, japa (mantra chanting), chanting of hymns dedicated to Devi in Her different forms, prayer, meditation and recitation of sacred texts including the Devi Mahatmya, Sri Lalita Sahasranama, and the Durga Saptashati. Navaratri, Dussehra and the Ramayana Navaratri highlights the principles elucidated by the Ramayana. This is hinted at in the other name by which Vijaya Dashami is known in India, Dussehra. “Dussehra” is derived from “Dasha-hara,” which means “victory over the ten-faced one.” This ten-faced being (“Dashamukha”) is none other than Ravana, Lord Rama’s adversary. His ten heads symbolize the ten senses (five of perception and five of action). Ravana’s manifest extrovertness stands in contrast to Dasharatha, Lord Rama’s father, whose name can be taken to mean “one who has controlled his ten senses.” That he is a father to a Divine Incarnation suggests that only when one can subdue all ten senses can one realize the divinity within. In similar allegorical fashion, Sita, Rama’s consort, represents the mind. As long as the soul remains wedded to the Self within, so long will bliss ensue. That is why Rama and Sita are depicted as enjoying a harmonious and satisfying relationship, both amidst palatial comforts and the privations of the forest. As soon as the mind withdraws from the Self and turns outwards to worldly objects, bliss ceases, and sorrow follows. In the Ramayana, Sita becomes distracted by a golden deer, actually an asura (demon) in disguise, and starts covering it. Rama counsels her on its true nature, but Sita remains deaf to his words of wisdom and insists that he capture it for her. Rama orders Lakshmana to stay with Sita and protect her from danger, while He pursues the deer. As soon as Rama hunts it down, the magical deer treacherously calls out, in Rama’s voice, to Lakshmana and Sita for help. Hearing this, Sita is convinced that Rama’s life is in danger and tells Lakshmana to hurry to Rama’s rescue. Lakshmana, who represents tapas (austerity), recognizes that the situation is a trap and tries to advise Sita accordingly. Sita arrogantly rebuffs his explanations and orders him to leave at once. Seeing no other way out, Lakshmana goes in search of his brother. Before leaving, he draws a line on the ground and warns Sita not to cross the border. This line, the Lakshman Rekha, marks the limits of morally permissible behavior. Because Sita trespasses into forbidden territory, she has to suffer the consequences: she is taken captive by Ravana. Only after this ten-headed egoist gets destroyed, just after the ten senses are controlled, is Sita reunited with Rama. The story of the Ramayana is relevant to us as well. If we wish to progress spiritually, we have first to make efforts to control the negative tendencies. Only then can we cultivate the positive ones. In the Bhagavad Gita, Lord Krishna enumerates the signs of a Jnani (one who has realized the Self), not because an ordinary person can recognize such signs, but so that we may cultivate those qualities. Likewise, Amma says that we should read stories about Lord Rama so that we may become Rama Himself, that is, imbibe His great attributes. A deeper meaning of the festival Navaratri suggests the spiritual growth of a person, where one needs the courage to stand up for others and protect the weaker and be able to fight the evil and their temptations. This is the first requirement of spiritual growth – to take a firm against the evil and for good. The second requirement is to fulfill one’s needs, treat the guests and help the poor. For this one needs money and the next three days of Navratri are dedicated to the worship of Lakshmi so that she would bless us with the necessary funds to be put to good use. Learning virtues and good qualities and upholding one’s responsibility as a sacred duty is the next requirement to the spiritual growth. Finally, Goddess Saraswati is worshipped so that she blesses us with the power of knowledge and helps us to attain spiritual enlightenment. The nine nights festival of Navratri begins on the first day of Ashwin of the bright fortnight. The festival comes to an end on the tenth day of Vijay Dashmi or Dussehra, when the idols of the Goddess Shakti are immersed in the river. Dussehra, is thus, considered auspicious for beginning mantra incantation and renouncing the world as ‘Sanyasi.’ However, Navaratri has a message for people who lead worldly life too. It teaches us to surmount obstacles with the help of Durga, thank and pray to Lakshmi for her blessings and gain knowledge with the benefits of Saraswati. This done, we can find Shakti (power) within ourselves. We must also understand that Durga, Lakshmi, and Saraswati are different facets of a single entity, thus, representing that Mother Goddess bestow us with wealth, prosperity and knowledge and protect us too. Much of this article is a compilation.